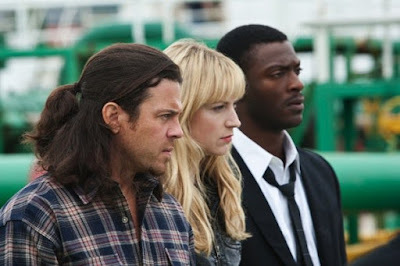 After last night's amazing Leverage season finale, the TNT crime drama became my new favorite show. Sorry Castle and Chuck. "The Maltese Falcon Job" had it all: Eliot punching out 13 bad guys, Parker dressed up as a French maid, Hardison in a suit, Tara in a towel, Sophie's return, and Nate falling on his sword to save his teammates. It had drama, it had comedy, it had suspense. All in all, last night's episode was as close to a perfect as a TV show could be. I seriously can't wait until the summer when season 3 kicks off.